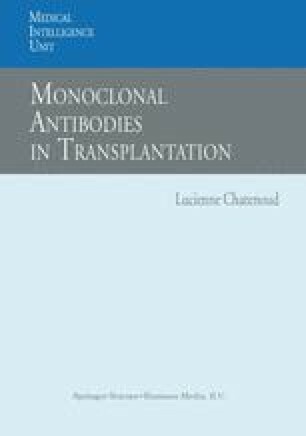 Fifteen years of experience in using immunosuppressive monoclonal antibodies for studies predominantly in experimental and clinical transplantation, but also in autoimmunity, has clearly demonstrated the existence of therapeutic activities not shared by conventional chemical immunosuppressants (i.e. corticosteroids, azathioprine, cyclosporine, FK506). Antibodies to CD3 (OKT3) have been remarkably efficacious in reversing severe acute allograft rejection, a clinical situation in which only high-dose steroids and polyclonal antilymphocyte antibodies have similar efficacy.1–3 More importantly, antibodies or genetically engineered molecules to distinct T-cell receptors (CD4, CD4+CD8, CD28/CTLA4Ig, adhesion receptors or adhesins) can promote tolerance, namely, a stable and antigen-specific state of immunological unresponsiveness.4 As a result, a wide variety of experimental situations have been described where T cell-directed monoclonal antibodies have afforded tolerance not only to foreign soluble antigens but also to tissue alloantigens and autoantigens.5–16 Thus, despite the different problems surrounding their production and clinical development, i.e. high cost and side effects (namely, acute cytokine-related syndrome, xenosensitization), continued effort in pursuing the study of therapeutic monoclonals appears worthwhile.